Please click the following link for the printable pdf. 20160612 PCS Acts1-2 - For the full printable file, please click the following link. For printable version, please click the following link. 5/15/2016 - Post-College Service - John 9 - For printable version, please click the following link. 5/8/2016 - Post College Bible Study - Go - Click the following link to download a printable pdf. 5/1/2016 - Post College Service - Intercessory Prayer - Click the following link for a printable pdf. Please click the following link for a printable pdf. Post Grad Service 4/3/2016 - Click the following link for printable pdf. Postgrad Service 1/31/2016 - Prayer II - Click the following link for the printable pdf. Postgrad Service 1/24/2016 - Prayer I - Click the following link for the printable pdf. Postgrad Service 1/11/2016 - Repentance - Please click the following link for printable pdf. Postgrad Service 1/3/2015 - Geneology - Please click the following link for printable pdf. Postgrad Service 12/13/2015 - Jonah Click the following link for printable pdf. 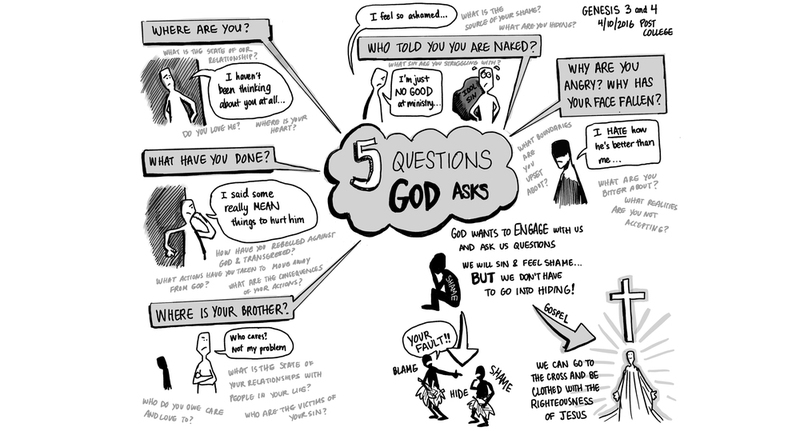 Postgrad Service 11/1/2015 - Philippians 4 - Please click the following link for printable pdf. Postgrad Service - 10/25/2015 - Philippians. For printable pdf, click the following link. Postgrad Service 10/18/2015 - Four Soils - For printable pdf, click the following link. 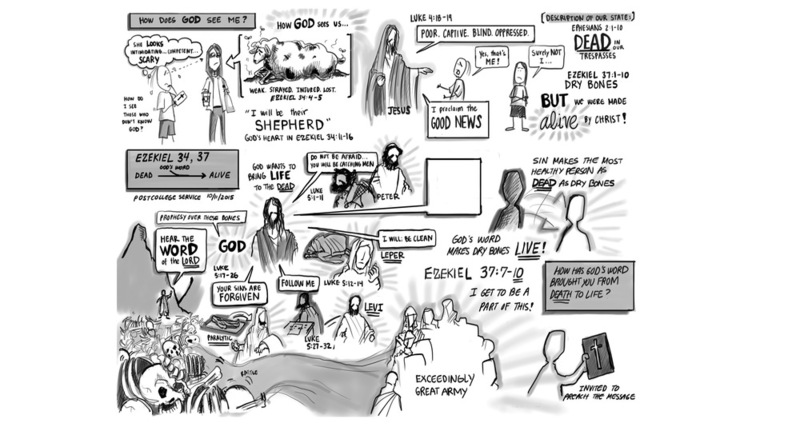 Dead to Life - Please click link below for downloadable pdf. 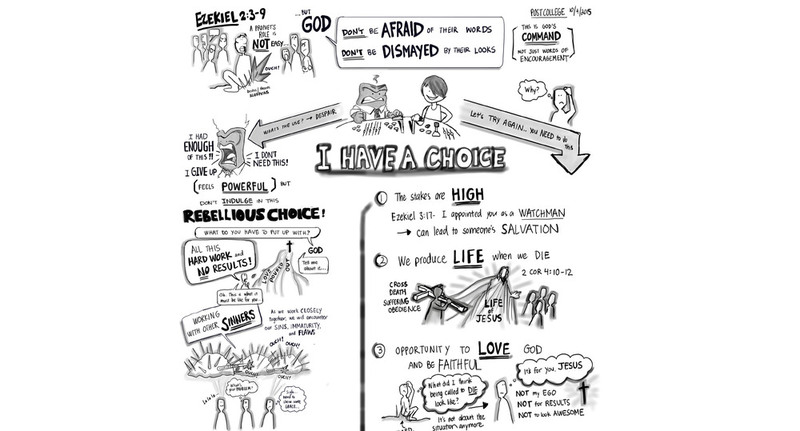 Ezekiel - I Have a Choice - Sketchnotes - Click below for printable pdf. 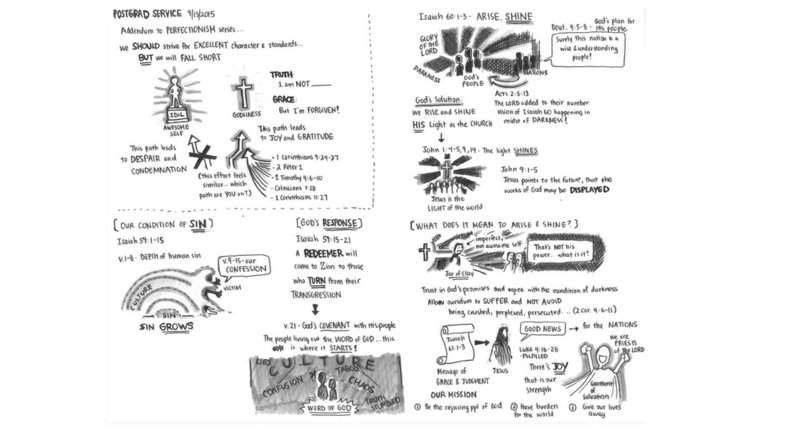 Jeremiah - Recovering Devotion - Sketchnotes, please click link below for printable pdf. | Listen to the podcast. When Israel was wandering in the desert, it turned out to be beautiful times of devotion and humble dependence on God. But when Israel entered the Promised Land, the downward spiral of debauchery, corruption, and idolatry ensued. How do we get back to God then? It’s not that the Promised Land and such blessings are suddenly bad, but there is a solution. And we can start to recover devotion towards God when we more deeply engage with and humble ourselves before God’s Word. 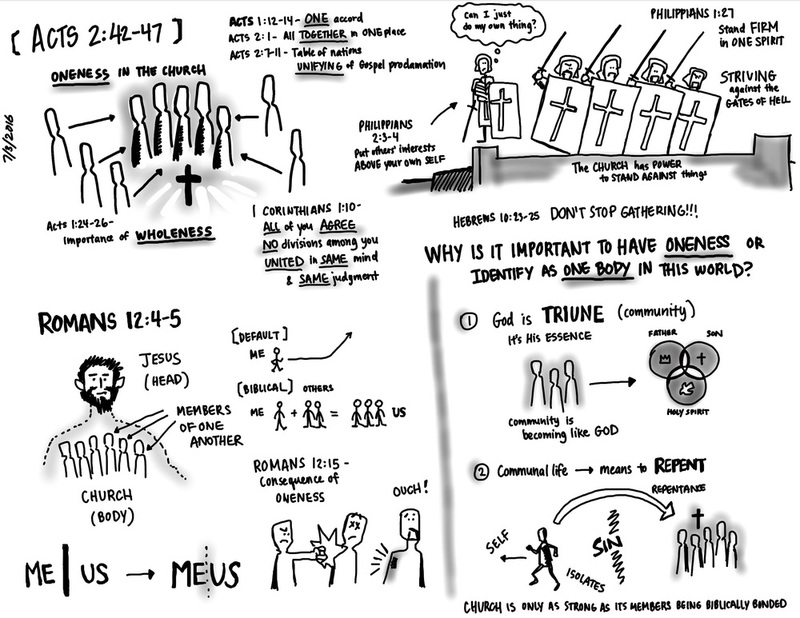 Perfectionism IV - Sketchnotes, please click link below for printable pdf. | Listen to the podcast. What is God's vision for us if it's not about us being awesome? We're sinful, broken, imperfect, and not awesome. 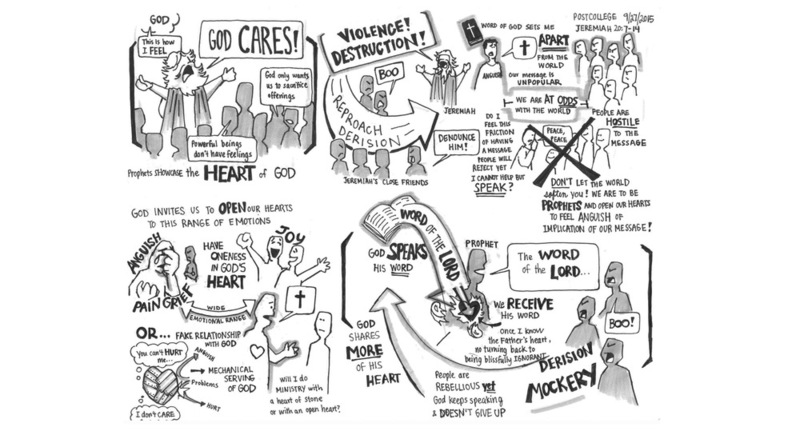 Not only are we sinful, but we live in a world that is pervasive in sin. 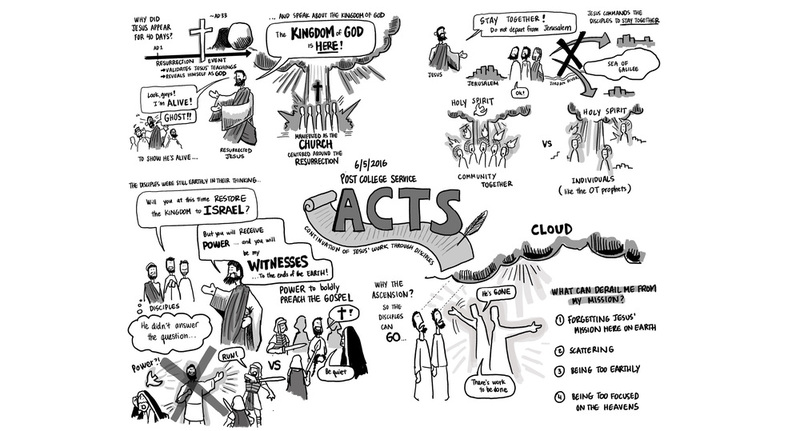 Into this picture, God intervenes and gives us the light of the gospel, and he calls us to be light in the darkness as the church for the nations to see. Though we are imperfect, we can display God's awesomeness to the nations when we embrace this incredible vision of life. 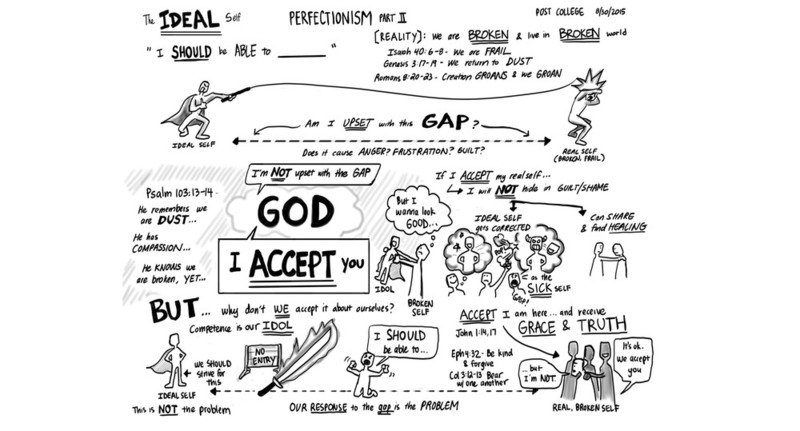 Perfectionism III - Sketchnotes, please click link below for printable pdf. | Listen to the podcast. We think we should be able to master our body, not get angry at our spouse, not make mistakes, remember people’s stories, keep up with the bills, maintain a clean home, maintain a stock fridge, not feel behind, and the list goes on. With these self-imposed expectations on ourselves, we are unable to experience grace. We idolize competence and this impossible picture of ourselves being able to do everything, be everywhere, and not make mistakes. As we look at the Scriptures, we look at how we can gain perspective and find lasting joy in the gospel rather than in our competence and abilities. 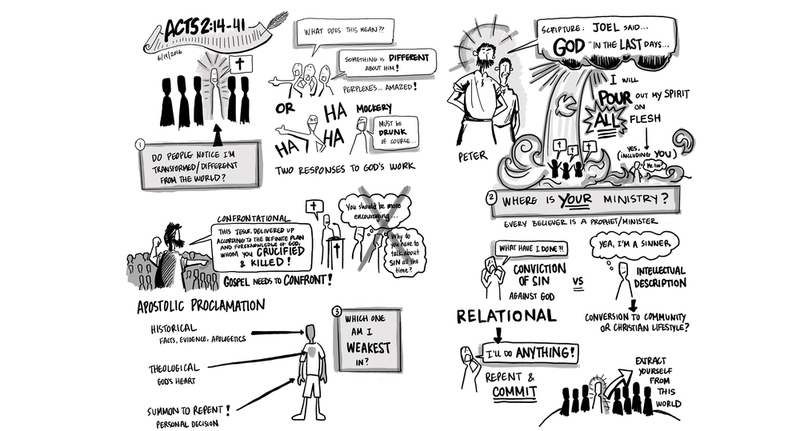 Perfectionism II - Sketchnotes, please click link below for printable pdf. | Listen to the podcast. We know that we’re not perfect, but our imperfections can bother us and upset us to the point where we cannot grow. We hold an idealized view of ourselves that is not realistic while not accepting the imperfections of our real serves, which can become a constant source of frustration and shame. 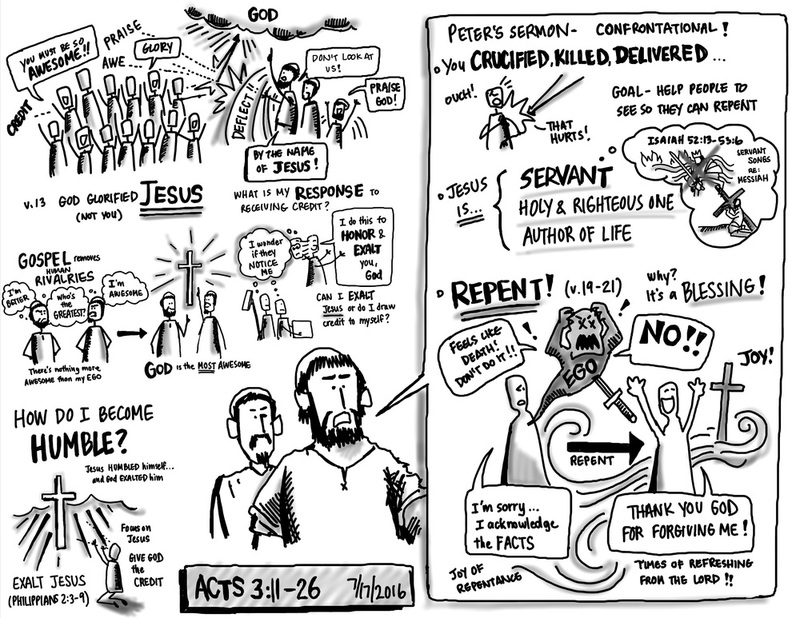 In this message, we look at the problem of the gap between our idealized selves and our real selves that often torments us, and how the gospel can cover that gap.